Hughie Fury: What’s the Rush? By Dan Fitz-Simons: Hughie Fury (21-1) with 11 KO’s will face a new opponent less than 3 months after winning the British heavyweight (BBB OF C) title by TKO over Sam Sexton. His Dad, Peter Fury, wants to keep him busy, so Hughie should be back in the gym in a week or so. Moreover, his win over Sexton, while not spectacular, proved he’s back on track for bigger fights in the division. What’s changed is that Hughie is sitting down on his punches. He didn’t run around the ring facing Sexton, and he displayed a mature “hands-up” stance. He’s definitely improving with age. His footwork, speed, and defensive skills were well above average, and he had the confidence to let his hands go and mix it up on the inside. As a result, Hughie, one of the best boxers in the division, can now bang, and that could be a deadly combination. Nevertheless, he’ll have to work on his over-hand right for accuracy and power. Tyson Fury stated that Peter Fury wanted both he and Hughie to develop their right hands. Hughie also has an annoying tendency of using his left as a measuring tool instead of a jab, a tactic unpopular with fans and troublesome to referees. Yet He put on an entertaining performance, throwing punches from angles, feinting, and skillfully using the ropes. Although Hughie currently lacks the pedigree of a top-ten contender, he’s getting there. 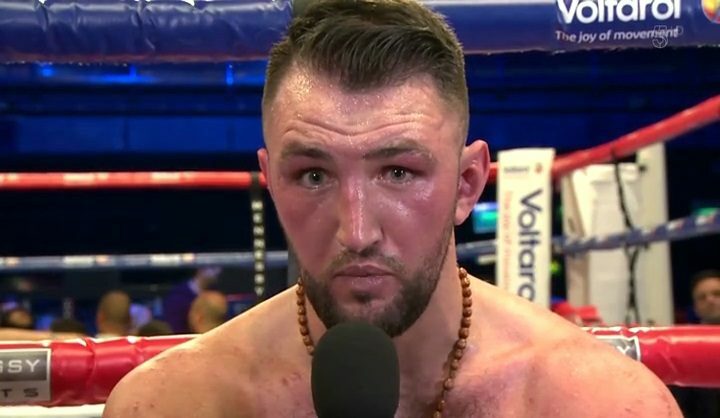 Unfortunately, Hughie’s Dad, failing to learn any lessons from the Parker fiasco, insists Hughie is ready to take on Deontay Wilder or Anthony Joshua. But the consensus is Hughie has to fight more frequently and KO more opponents before facing Wilder or AJ. A less “delusional” scenario would match Hughie against opponents like Dereck Chisora or Manuel Charr. Chisora would be a popular draw in the UK, and Charr has a (technical) WBA title. Another alternative is to line Hughie up with European level challengers. He could fight Agit Kabayel for the EBU title, and Otto Wallin for the EU belt. Winning 3 alphabet titles (EBU, EU, and BBBofC) at 24 would be quite an accomplishment, and it could be achieved within a year. Hughie could also fight in the U.S. on SHO, HBO, or ESPN to extend his American fan-base and face legitimate U.S. contenders like Adam Kownacki and Charles Martin. One last option would be to allow the top contenders (Pulev, Whyte, Ortiz, Povetkin etc.) time to battle it out, and when the smoke clears, move in for the title. This strategy demands that Hughie stay busy, but at 23, he should be fighting 3-4 bouts over the next 2 years anyway. There’s plenty of time for young Hughie to move up the ladder. Whatever path is taken, it’s nice to have him back in the contest. The best of luck to Hughie Fury. Boxing » News » Hughie Fury: What’s the Rush?